Xi’an (xī ān 西安) ranks first on the list of the country’s seven largest ancient capitals with a long-standing history and is known for being the capital city for 13 dynasties. It marked the starting point of the world famous Silk Road. Since the 1990s, the city of Xi’an has re-emerged as an important cultural, industrial and educational center of the central-northwest region, with facilities for research and development, national security and China's space exploration program. Now, this city harmoniously combines its ancient charm with a modern atmosphere. Big Wild Goose Pagoda (dà yàn tǎ 大雁塔), also called Da Ci’en Pagoda (dà cí ēn tǎ 大慈恩塔), located in southern Xi'an (xī ān 西安), Shaanxi (shǎn xī 陕西) province, was built in 652 during the Tang (tang 唐) Dynasty. The original function of this pagoda is to dedicate the Buddha figures, 657 kinds of sutras, and several Buddha relics that Xuanzang (xuán zàng 玄奘), the Buddhist translator and traveler, had brought from India. 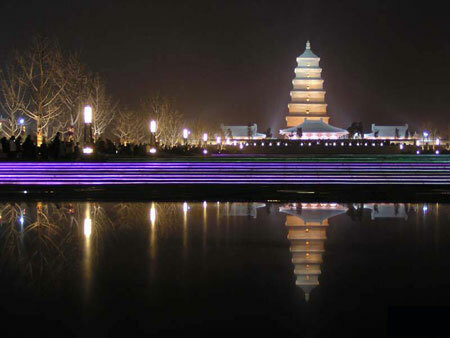 Big Wild Goose Pagoda is now regarded as the symbol of the ancient Xi’an. Xi'an Beilin Museum (bēilín bówùguǎn 碑林博物馆), is a museum for steles and stone sculptures which is located in Xi'an, China. In 1944 it was the principal museum for Shaanxi Province on the site of what was formerly a 11th century Confucius Temple. Then because of the large number of steles, it was officially re-named as the Forest of Stone Steles in 1992. 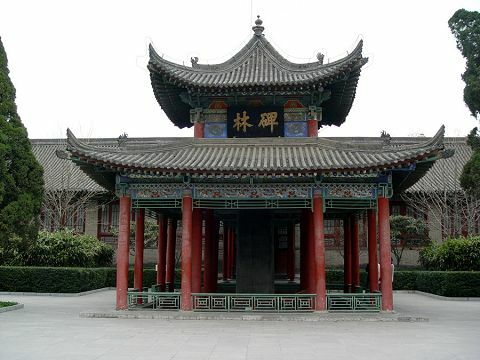 All together, there are 3,000 steles in the museum, which is divided into seven exhibitions halls, which mainly display works of calligraphy, painting and historical records. The 8th Route Army Memorial (Bā lù jūn Xi'an Bàn shì chù Jì niàn guǎn 八路军西安办事处纪念馆) is the former site of the Eighth Route Army (ERA) Xi'an Office. It lies at No 1 Qixian Zhuang (manors for seven virtuous persons), Beixin Street (a new street in the north), Xiwu Road (the fifth road in the west), Xi'an City, Shaanxi Province. It faces south and has 10 rooms. 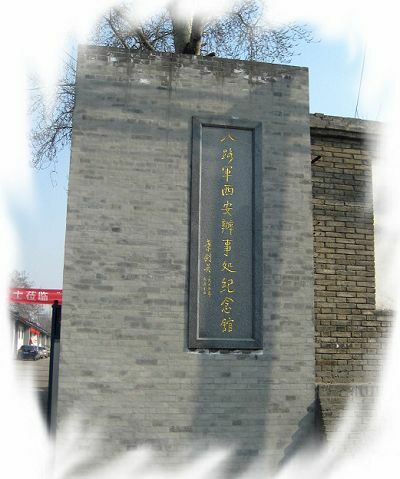 It has been rebuilt as the Memorial Museum of the Eighth Route Army (ERA) Xi'an Office. The Small Wild Goose Pagoda (xiǎo yàn tǎ 小雁塔), is one of two significant pagodas in the city of Xi'an, China, the site of the old Han and Tang capital Chang'an. The other notable pagoda is the Giant Wild Goose Pagoda, originally built in 652 and restored in 704. The Small Wild Goose Pagoda was built between 707–709, during the Tang Dynasty under Emperor Zhongzong of Tang (from 705 to 710). 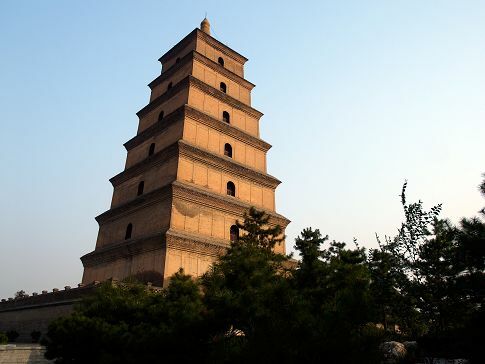 The pagoda stood 45 m until the 1556 Shaanxi earthquake. The earthquake shook the pagoda and damaged it so that it now stands at a height of 43 m with fifteen levels of tiers. 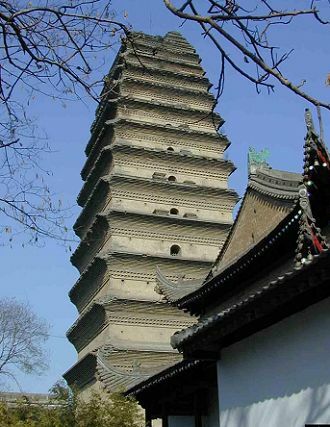 The pagoda has a brick frame built around a hollow interior, and its square base and shape reflect the building style of other pagodas from the era.